Ladies and gentlemen, it’s an incredible honour to stand before you this evening as we take our first steps as a new council, to build on what we’ve started, and to advance our vision to make Kingston a smart, livable, and leading city. I would like to begin by thanking our community for their confidence and for a renewed mandate to serve as mayor. I am ready to continue my role as a champion for Kingston, to go to bat for our city, and to attract ideas, investment and people to our community. I would also like to congratulate all eight of my returning council colleagues and also to welcome four new councillors to the horseshoe here in council chambers. We have lots of hard, but exciting work ahead of us. Our task is to chart a course forward for our entire community, and to act on the mandate we have been given by Kingstonians. Together we will build our city, and create and expand opportunities for everyone in our community to succeed and thrive. It is clear that the progress we have made together over the last four years has created momentum, a sense that we are pushing forward and embracing a future where our city is on the frontlines of the change and growth we see happening in our world. While we should be proud of what we have achieved over the last four years, our vision is not to coast on these successes, but to build on them and to imagine new possibilities for our great city. For example Breakwater Park and the Gord Edgar Downie Swimming Pier have become an inspiration for new and exciting improvements to our waterfront. The state of the art Rideau Heights Community Centre will be a catalyst for further rejuvenation in the north end of the city. The construction of the Third Crossing will be a foundation for renewal along the Cataraqui River, spurring everything from commercial development along Montreal Street to new waterfront pathways and a corridor for active transportation along the Inner Harbour. The vision to make Kingston a smart, livable, leading city has firmly established us on a path of progress. Now, it is up to us to embrace this vision and to make our city a model for smart growth, where the goal isn’t just about making our city bigger, but also about making it better. On the one hand we will oversee projects that have already begun, like the visioning for Belle Park, the new east end community centre, and of course the Third Crossing, and ensure they are completed on time and on budget. At the same time, we will move to address new challenges and to embrace new opportunities. This brings me to one of the top issues facing our community right now – housing. Currently Kingston has the lowest rental vacancy rate in the province. As a growing community we require a greater supply of housing, so we must act now to keep housing affordable in our community by expanding housing in creative ways. We will look to encourage more rental housing, more townhouses and starter homes, more housing options for seniors, quality apartments for students and integration of new affordable housing units in neighourhoods across our city. A healthy supply of housing that is affordable, together with housing options for those who need support is a critical part of our City’s vision. That is why in my first 100 days I will ask for Council’s support in establishing a Mayor’s Task Force on Housing. This task force will bring key stakeholders together to examine best practices and to explore all possible tools and incentives the City can offer, to enable developers, non-profits and community agencies to build more housing in general and more affordable housing in particular. I will ask this task force to get to work quickly, and report back to Council with their ideas and solutions, so that by this time next year we can begin implementing their recommendations. In adopting a path of smart growth we will also recommit ourselves to the vision that new housing should be built within the urban growth boundary. In this way, transit, walking and cycling become viable and attractive options for moving around the city. By unlocking both undeveloped and underdeveloped properties within the city core, we can encourage better designed buildings with smaller environmental footprints. As we move forward, we will also engage our community in a broad discussion about what intensification should look like. Instead of debating tall buildings on a project by project basis, we will have one overarching discussion, building on our City’s Official Plan, to better clarify how we should balance the goals of intensification and heritage preservation in the downtown. It’s important to emphasize that smart growth is not just about more housing. It’s also but about enhancing the quality of the community. That’s why we will move forward with a strong commitment to our local environment, ensuring that we expand green spaces, walking trails and access to the waterfront alongside fixing roads, sewer pipes and new building construction. 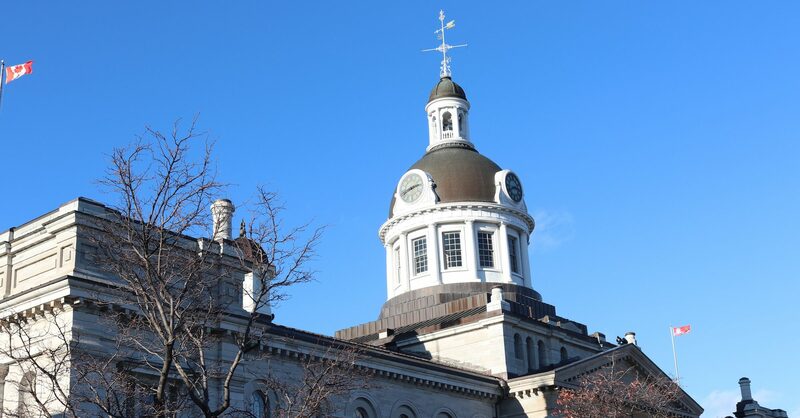 As a council we will continue to advance transit ridership, electric vehicle infrastructure, and promote active transportation options that will ensure not only that Kingston is a green city, but that we are a healthy city focused on preserving biodiversity, green infrastructure, clean air and water. Of course a growing community requires a growing economy, which will require a targeted approach to economic development that builds on our local strengths. We will use our new relationships with international businesses like Frulact and Feihe to open up other doors to global opportunities that will bring more jobs and investment to our community. We will leverage the leading research and development in our local health care sector to encourage new business growth. Thanks to the expansion we’ve seen over the last few years, we now need more room for Kingston businesses to grow, so we will work to increase industrial space across our city. We will also seize opportunities like the Maple Leaf fibre project, a new long haul fibre optic cable between Toronto and Montreal. This new information highway of the future passing through Kingston has the potential to attract data centres, technology companies and new jobs and employment to our city. At the heart of this vision for growth is the creation of a culture of innovation in our city, where Kingston is both a laboratory and a showcase of new ideas, approaches and solutions. I certainly make no secret of my passion for innovation, and I am convinced that we have in our community both the talent and the creativity to develop both city altering and world changing ideas. As I speak there are many teams of students at Queen’s, St. Lawrence College and RMC who are developing new ideas to address challenges the city is facing as part of the Mayor’s Innovation Challenge. Early next year they will pitch their ideas about how to reduce carbon emissions, revitalize public spaces and improve the quality of life of residents at Rideaucrest long term care home. This is just one of countless examples of where small businesses, non-profit organizations, institutions and researchers are embracing the power of new ideas as the key to solve long standing problems. In fact, innovation is really about changing our approach to challenges and limitations we face as a community. It might be the development of biogas as a clean energy alternative to reduce our city’s carbon footprint. It might be a family mediation worker who can prevent youth homelessness before it starts by helping to resolve family conflicts. Or it might be new road maintenance techniques like microsurfacing or better asphalt quality, fueled by research collaboration between the City and Queen’s University. In a future driven by innovation, we will work to combine new ideas and technologies to create not only better services for residents, but also new opportunities for new businesses to begin and for existing businesses to grow. Imagine the impact of technology from our local military base that we are combining with GIS data, to can create a digital replica of the city of Kingston to an accuracy of 5 centimetres. We will be able to use this digital version of our city to test the look and function of new buildings, new roads or streetlights before they are actually built. Then imagine the impact of making this data available to innovators and city builders, in turn making Kingston a leading centre of municipal and public sector innovation. In order to encourage innovation and grow our economy, we must ensure that employers can find the talent they need. That’s why as a city we continue to lead the implementation of a workforce development strategy for Kingston. That work starts by ensuring young people in our community know where tomorrow’s opportunities will be, so that they can pursue the right education, the right training and acquire the right skills, whether it’s to replace retiring baby-boomers in existing jobs, or to take on new roles in a 21st century economy. And while helping everyone in our community to find fulfilling careers, we will also welcome new residents from across the province, the country and the world, with a clear commitment to a diverse and inclusive community. Smart growth includes not only how we welcome new residents, but also how we welcome visitors. We will look to build on the momentum of tourism initiatives, drawing on the enormous success of the Kingston Penitentiary Tours. With a new deep water dock in the downtown, we will position our city as a premier destination for national and international visitors in the expanding Great Lakes cruise ship industry. Visitors are drawn here to experience our history and culture, so we will continue to facilitate the restoration of heritage buildings into modern spaces. The restoration of Portsmouth Town Hall into incubation space for new technology firms serves as a perfect model for other heritage buildings like the Queen City Oil Warehouse and the Bailey Broom Factory. In this way we will increase the charm of our historic downtown and waterfront while adding to our unique, authentic tourism brand. As we address the challenges we face and position ourselves for the opportunities that are in front of us, there will be pressures on our city’s budget. However we must continue to live within our means. In the last four years we have been able to limit property tax increases to inflation. To build on that foundation of fiscal responsibility, in the coming days I will propose a new fiscal formula, where we create an explicit link between growth and property tax increases. That way, the more we grow the lower the annual property tax increase will be. To be clear, smart growth cannot be achieved by the city in isolation. This vision must be fueled by partnerships where the city, businesses, hospitals, universities and colleges, our military base and organizations agree together that our own individual goals can best be achieved when our entire community works together. As we compete with larger cities I am convinced that one of our biggest advantages is our ability and our willingness to collaborate. So tonight I look forward to renewing our partnership with the business community, with our public sector partners, with labour groups and neighbourhood associations, volunteers, non-profits and entrepreneurs, to build our community together. I look forward to partnership between the City and Queen’s on the future expansion of Innovation Park as new space for innovation, entrepreneurship and job growth. I look forward to partnership between the City and St. Lawrence College on a future downtown campus that will establish Kingston and SLC as a centre of excellence in tourism and hospitality. I look forward to partnership between the City and Frulact and Feihe, as we open up new international opportunities and focus. I look forward to partnership between Kingston and other cities across Eastern Ontario as we develop strategies to grow our region and leverage key regional assets like Kingston’s newly expanded airport. To foster a spirit of partnership with the community, we will continue our commitment to open and transparent government. I look forward to building on the progress of the last term, with more innovative, convenient and effective public engagement. Thanks to new tools like the City’s new online survey platform, thousands of Kingstonians are now providing their input and ideas on a whole range of city projects and political issues. As we move towards budget deliberations and strategic planning early next year, we will look to test run new approaches for public input, like an open house for council, where citizens can discuss their priorities with members of council in a more welcoming forum. A team approach will be needed across our community, and a team approach around this table is paramount. In the last four years, we set the bar for what a constructive, professional council can be, and tonight I assure you that I will do everything I can to ensure that same spirit of respect and collaboration resides in this Chamber. I know I can count on everyone around the table to commit to this same approach over the next four years. In the midst of a world today where politics has become increasingly angry and divisive, our city and this council can demonstrate that there is a better way. Make no mistake, in the coming months we will have sharp disagreements and heated debates, we will challenge each other’s viewpoints and confront each other’s opinions. But at the same time we will share an understanding that we are all here to work toward the same goal, to make Kingston the best community it can be. My commitment to City Council, to City staff and to the wider community is to lead the best way I can, to be a champion for this city, a leader for our community and to work hard every day over the next four years to create opportunities for people in Kingston to succeed and thrive.